Piano Opening Hours: Daily 24/7. Piano donated by Gavin Gray and decorated by Bea Bayes and Ella Bayes. 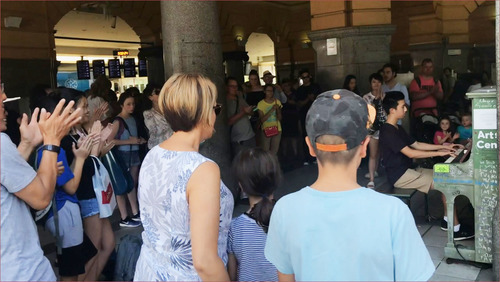 Hosted by Flinders Street Station. An awesome bit of funk from a couple of self-proclaimed 'non-pianists' - um, I beg to differ! This was an original song composed by the guy on the left. They then proceeded to sing Toto's Africa - stuff of legends! Night made. 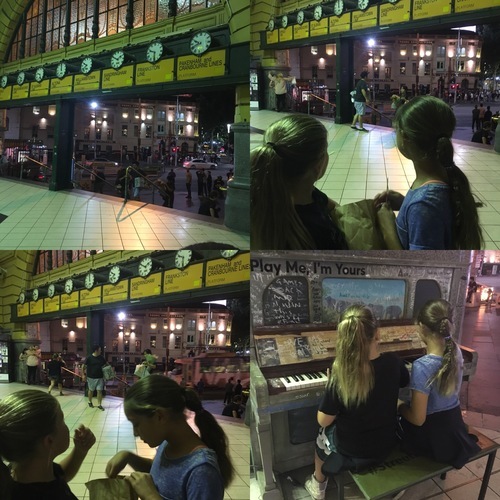 Impromptu improv piano duet of J'y Suis Jamais Allé by Yann Tiersen at Flinders Street Station on the last day of Play Me, I'm Yours. Impromptu piano trio at Flinders Street Station on the last day of Play Me, I'm Yours. This guy killin' it on Purple Rain... Prince would be proud! Frenchman playing a Yann Tiersen piece from Amelie. Très beau! Had an amazing experience playing at Flinders! Met a lady who was diagnosed with brain cancer; she continues to play piano to keep her brain "awake". She was told she had 14 months to live... 9 years ago. Hope to see these pianos again soon!